Lake Shelbyville's abundant miles of shoreline and 11,000 acres of water is paradise to visitors from all over the country. There's plenty of room for playing, fishing, picnicking, hiking, hunting or simply unwinding. The lake, overseen by the U.S, Army Corps of Engineers, offers sparkling waters, sheltered coves and six sandy beaches. Wolf Creek and Eagle Creek State Parks also border Lake Shelbyville. The parks encompass miles of shoreline and large tracts of carefully maintained indigenous woodland ... ideal for camping, hiking, horseback riding and snowmobiling. More than 1,200 campsites around the lake provide a variety of camping experiences. Lake Shelbyville offers some of the best fishing in the Midwest and it gets better every year. For hunters and naturalists, three designated wildlife management areas totaling more than 6,800 acres are located around the lake. 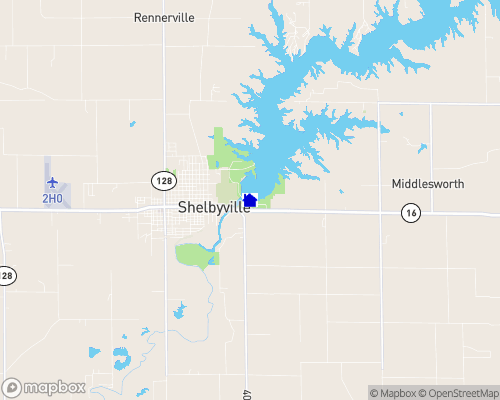 Lake Shelbyville and its surrounding small communities offer you an escape from the fast-paced, impersonal lifestyle that's becoming the norm in larger metropolitan areas. In these communities, you can relax, do a little shopping or antiquing ... have a hearty meal ... chat with the locals. You'll find yourself walking a bit slower, breathing a little deeper and smiling a lot more often. Lake Shelbyville is renowned for great fishing! In fact, Lake Shelbyville was selected by Bassmaster Magazine as one of the best bass lakes in Illinois. A rural Windsor man and Lake Shelbyville fishing guide, Bruce Sanders, caught and released the new Lake record white bass! The record bass weighed in at 4lbs. 2oz.The U.S. Army Corps of Engineers maintains sizeable populations in 16 ponds that it manages in conjunction with the local Department of Natural Resources. Visitors can fish in more than 11,000 acres of clear water where catfish, largemouth bass, crappie, walleye, muskie, white bass and bluegill are in abundance. The new Lake record Catfish was caught in 2002 by Shelbyville resident, Chris Rentfro. The catfish was 62 lbs. 10oz. and was 48 inches long!! Lake Shelbyville offers some of the best largemouth bass fishing in the Midwest. Novice and avid fisherman alike will find plenty to catch, even with the 14-inch minimum length limit. Fishermen appreciate the fact that the average-size keeper is more than two pounds. Tournament anglers generally need to catch between 16 and 17 pounds to win the average one-day event! Fishing reports on Lake Shelbyville regularly include mention of active muskies feeding in the backs of coves or of muskie caught by accident off deep-water points-especially in the prime months of April, May, October, and November. Since a number of Muskie were caught over the 36-inch limit, the new size limit is now 48 inches. A decade down the road if these fish are caught and released properly we will have 40 to 50 pound muskies in Lake Shelbyville. The longest Muskie caught in Lake Shelbyville, on September 14th, 2001by Tom Ozee of Mattoon, was 51 inches and weighed 30.09 ounces. Another Mattoon man, Matt Carmean, landed the newest Illinois State Record for Muskie. The new record was caught on April 20th 2002 weighing 38 pounds 8 ounces and 50 3/4 inches long! Lake Shelbyville promises, in the future, to be a leader in the Muskie world. Herrick, Illinois, located in Shelby County and Central Illinois, is a small community of approximately 450 residents. "Arthur, the Heart of the Illinois Amish Country," is a town of 2,200 residents located 10 miles west of Interstate 57 off exit 203. the friendly, down-home atmosphere helps to back up its motto, "Where you're a stranger only once." Illinois Amish Country's surrounding Amish settlement, established in 1865 by a handful of families, has grown to over 3,000 members. The Amish work rich farmland of the area with teams of six to eight horse hitches, and the Amish ' horse-drawn, black buggies are a common sight around the Amish country. The downtown business districts are filled with a variety of gift shops, fine clothing stores, unique craft shops, furniture shops and several restaurants. The surrounding countryside is dotted with many Amish shops, as well as a major theme park, Rockome Gardens. Rockome features attractive flower and rock gardens, gift shops, and other activities. Industry also thrives in the area with many reasons for businesses and business-people to find Arthur an attractive place to establish a presence. With a strong work force and a healthy economic climate, the Amish country is a great place to live and a great place to work! Located in the heart of Central Illinois, Mattoon offers visitors a warmth you don't find just anywhere. What's more, the community of nearly 20,000 serves as the center for scores of regional attractions.